Winter has been fairly mild in North Texas over the last two years. However, this is Texas, and you never know when we are going to get hit with a hard freeze, or ice and snow. It’s really important to protect those pipes during cold weather! Get your heating system checked out now so that you can prevent expensive repairs at the height of a storm. A minor tune-up now could save you big bucks later. When the temps drop below freezing, set your heat no lower than 55 degrees. The walls where your pipes are located have much colder air than your living spaces. Open doors to unoccupied rooms in order to keep a steady temperature throughout the house. Open kitchen and bathroom cabinet doors where your sinks are located (especially if the sinks are located on an exterior wall) to allow warm air to circulate around the pipes. 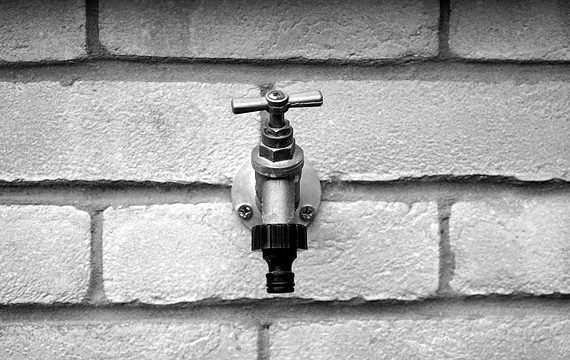 Open the faucet taps to allow a trickle; running water through pipes can prevent freezing. If you have a chimney, get it checked out by a licensed contractor. Creosote is a flammable substance that builds up on the walls of your fireplace and chimney. If left unchecked, it can result in a chimney fire. Check weather stripping around doors, and caulk windows to minimize heat loss. Check your home now for any water leaks and fix them immediately. Wrap pipes in UL-listed heat tape and insulate them if they are in unheated areas. If you have plastic pipes, use only thermostatically-controlled heat tape. Hardware supply stores often sell foam insulation that you can wrap around exposed pipes. Locate where your pipes are now and learn how to shut off your water. If your pipes do freeze, you can shut off your water and possibly prevent water damage. Trim your trees and remove any dead branches so they don’t damage your home if they fall because of ice, snow, and wind. Clear out your gutters so that melting ice and snow can drain properly. Check smoke/fire alarms and carbon monoxide detectors. Replace batteries, and make sure the detectors are functioning properly. Repair any handrails or steps so that they are safer in the snow and ice. Stock up on ice melting compound to keep your sidewalks and walkways safe. Homeowners insurance should be updated and reviewed annually or as needed. Be sure that you have the correct coverage so that you can be protected throughout the winter weather. Contact us today at Complete Financial Group, and see how we can help you find an exceptional insurance policy on your home. 940-382-9300.